Robert Adams, Nehalem Spit, Oregon, 2013. Courtesy Fraenkel Gallery. The most compelling thing about landscape photography is not its ability to replicate the vastness of the wilderness, the tempestuous ocean, or the complexity of an old-growth forest. In fact, the associated feelings of reverence and wonderment can mask the relationship between people and nature. We often fail to think much of the highways and gas stations that get us to nature; we think of visitor centers as gateways rather than elements of the landscape, and the fiber optics cables and plumbing underneath our feet go completely unnoticed. Through composition and context, landscape photography illuminates the relations to nature that are forgotten or ignored when we’re immersed in it. 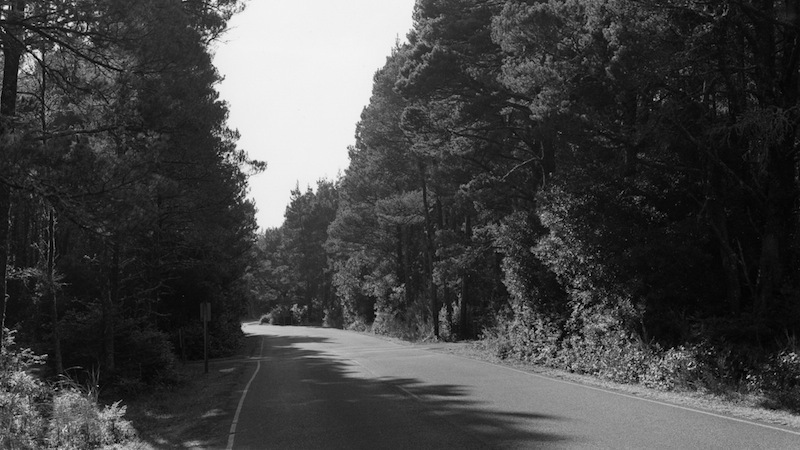 Robert Adams’ A Road Through Shore Pine at Fraenkel Gallery presents eighteen new photographs that foreground the artist’s own relationship, as a traveler and an interloper, with northern Oregon’s Nehalem Bay State Park, a place he has visited many times with his wife and family. The scenes depicted are rather unremarkable, as some of the most beautiful places are located in a soothing and monotonous expanse of trees rather than adrenaline-inducing cliffs or sweeping vistas. Adams gives these banal scenes meaning and depth that might otherwise drift away, as he does in his famous photographs of tract homes and gas stations. Most of the photographs in A Road Through Shore Pine are bisected by a two-lane asphalt road. One might find this diminishing to the natural beauty of the Tillamook Country woods, either an aesthetic flaw or a statement on society’s encroachment upon wilderness. Adams’ photos, however, appear to be an homage to that road, not the dirty, oil-stained asphalt, but the idea of it as a journey or a destination. Many travelers are particularly fond of certain roads — they are drawn to the trees that flank the pavement, the tourist traps that divert their spare change, or memories of conversations they’ve shared with a lover while speeding through a valley of dried sagebrush. In some of Adams’ photographs, the physical road is relegated to a corner of the image, almost out of sight, as if the photographer couldn’t keep it out of the frame while trying to capture some other nearby feature. But in others, the road dominates, drawing attention away from the surroundings. In one such image, it occupies most of the foreground, extending straight into the background. The viewer follows the road as it narrows and leads into obscurity. Through the installation of these images, viewers follow this road around bends and across intersections, eventually winding up at a clearing with a picnic table, then a sandy trail, and finally the sea. The last image of the series shows the sun struggling to shine through thick clouds at the edge of the continent. This sandy beach on the Nehalem Bay might be the destination of this trip, the reason to visit the state park. But only one image of this surely gorgeous beach is presented in the exhibition; instead, we are shown a sea of shore pines and the road that carries travelers through them. In his book Beauty in Photography, Adams writes that landscape photography offers three truths: geography, autobiography, and metaphor. On their own, he says, each of these may not be especially substantial, but together they tell us something about life. The photographs in A Road Through Shore Pine affirm this theory. With the road serving as a metaphor for a journey, viewers experience Nehalem Bay and its surroundings through the eyes of Adams the traveler.